Although I read far fewer psychological thrillers than I have done in recent years I do look out for those with a fresh premise. This one certainly ticked that box with the synopsis advising that Jessie Sloane is a young woman who finds out that her social security details belong to a girl who died seventeen years ago when she was just three. Now I think we can all agree that a discovery like that throws up a whole heap of possibilities for the direction that the novel can take. I like Mary Kubica’s writing, the setting and the people in all three of her previous books I have read have been carefully crafted giving this reader the feeling that she was truly having an insight into another life for the duration of the book. When the Lights Go Out was no different. While I might have queried the decisions Jessie made, all was easily explicable when considering the combined effects of grief and a lack of sleep. Alongside Jessie’s story we are taken back in time to read Eden’s too. This is an entirely different tale of a woman who meets the man of her dreams, and then the dream fades to a reality which is acres away from the dream. Of course the reader realises there is a link between these two narratives and each time it seemed that they were going to converge into the answer to the Jessie’s mystery, another piece of information came to dash that idea. All of this meant that the book was full of suspense. I was invested in both characters despite being on my guard knowing that all could not be quite as it appeared and I was therefore hooked to find out what the answers to the mounting questions were. Sadly despite being hooked by this psychological thriller for the majority of the book but I am afraid the ending just wasn’t for me. I don’t normally mention the endings because some of us enjoy a fairly open ending while others far prefer it when the author displays real skill in tying up loose ends into a neat bow. But the ending for this book deeply disappointed me and I so however much I enjoyed the journey, I can’t get passed that moment. This means that this is an incredibly hard book for me to review – how do you rate a book that you enjoyed all the way until the final reveal – if only Mary Kubica hadn’t ended this one the way she did the writing and the characters would have earned the full five stars . If you haven’t tried this author I highly recommend her earlier books, but sadly despite Mary Kubica’s obvious talent and her willingness to try something new, which I always applaud, I found this one to be less enjoyable. 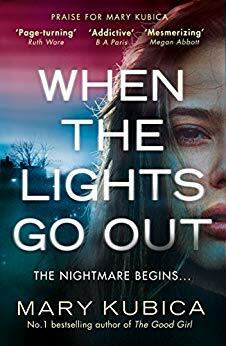 I’d like to thank the publishers HQ for allowing me to read an advance review copy of When the Lights Go Out prior to publication of today, 23 August 2018. I felt the same Cleo. Kept rechecking the ending in case I’d missed something but loved the story up until then. I was very disappointed despite having really enjoyed the book until then! Me too! I was so disappointed by this book because of the ending! I thought it was a terrible cop out ending that most editors would have advised against!! Exactly – a shame because up until then it was great! I have this book to read so it’ll be interesting to know what the ending is and if whether I will like it or not. It is disappointing when a story is great right the way through until the end. It’s such a shame when an ending lets the story down! Oh, I’m so sorry to hear you were disappointed by he ending to this one, Cleo. That’s such a shame when a book has your attention all the way through, and you’re absorbed – and then comes the end. Sorry to hear it! But you did remind me I need to put one Mary Kubica’s books in the spotlight, so thanks. I recently read The Good Girl and was disappointed. I am not sure I can take more of her books. Oh, no, so that’s why you said you hoped I enjoyed the rest of When the Lights Go Out…sigh. I hate bad endings in books…but maybe if I’m waiting for it, it won’t totally destroy me. LOL. Your difficulty with the ending may be a sign of why I’ve stopped reading this author. I believe she is better at creating situations than at resolving them. What a bummer. I appreciate your honest review though. I’ve never read her before. I found your review very interesting. Like you, I have enjoyed all of Mary Kubica’s previous novels, and was looking forward to tackling ‘When The Lights Go Out’. I’m in two minds, now, whether to do so or not: a bad ending to a book is such a downer! So sorry to hear that the ending was disappointing. I’ve not read this author before, so perhaps I’ll begin with one of her earlier novels. As you say Cleo, it’s a fascinating premise. Shame the ending let it down. That can colour your whole reading of a book. well honesty is key when it comes to these things! I’ve had my eye on this one. Now I’m on the fence. Worried about that ending. I don’t mind if they are left open, perhaps to continue as a series, but things do need to be wrapped up. I love your review on this one!